Rakkatak merges classical Indian rhythms and melodies with a pop music aesthetic. The concept started as Anita Katakkar‘s solo project in 2009, out of her need to share the subtle beauty of tabla in a non-traditional way. 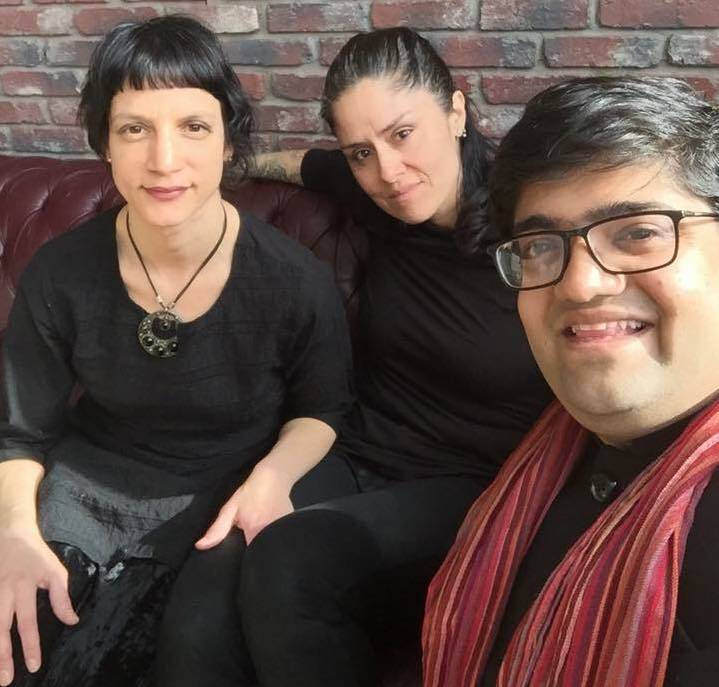 A year later, Rakkatak morphed into a musical partnership with bassist Oriana Barbarto and guest musicians including: Lisa Patterson, Morgan Doctor, Dino Toledo, Samidha Joglekar and Rex Van der Spuy. Rakkatak released their third album “Small Pieces” in April 2017 and are currently in the middle of producing their fourth album featuring master vocalist Pratik Rao and multi-faceted musician Zaynab Wilson. Rakkatak aims to: serve the Canadian-Indian community by maintaining the integrity of Indian classical music and giving it a space to evolve in a contemporary context; facilitate cross-cultural dialogue through our music; change the perception that tabla is a male dominated art form and further the notion that female artists can be leading professional instrumentalists. In addition to performing, Rakkatak has conducted numerous tabla workshops in the Greater Toronto Area. Selected performances include: the Women’s Percussion Festival at Toronto’s Lula Lounge, Hot and Spicy Festival at Toronto Harbourfront, Toronto Pride, Toronto’s Music in St. James Park, Toronto’s Arts in the Parks, Ottawa’s Barrymore’s and Robson Music Festival in British Columbia. With Indian/Scottish roots in multicultural Toronto, Anita Katakkar‘s music represents a link between her heritage and community. In Toronto, she studied tabla with composer and musician Ritesh Das and in California and Kolkata with the pre-eminent exponent of the Lucknow style tabla, Pandit Swapan Chaudhuri. Anita has performed, toured internationally and recorded with the Toronto Tabla Ensemble and Jeff Martin and has toured nationally with The Tea Party. She has shared the stage with legendary Kathak dancer Chitresh Das, flamenco dancer Esmeralda Enrique, sitar virtuoso Anwar Khurshid, Canadian/Armenian guitarist Levon Ichkhanian and Paris based singer/songwriter Melissa Laveaux. Oriana Barbato‘s signature style doesn’t come from market trends. This Chilean bassist goes well beyond pop by adding her knowledge of world music and downright technique to her bass playing. Oriana’s versatility, work ethic, and stage presence have brought her to venues across North America and Europe, where she was last seen opening with latin/flamenco fusion act TaKiLo for La Troba Kung Fu. She has also shared the stage with world-renowned musicians such as Qawwali master Shahid Ali Khan and Warwick endorsed bass prodigy Jorge Campos as well as opening for Canadian acts Bif Naked and Nomadic Massive. Oriana is also a sound artist and has composed music for short films. Her work has been exhibited at various art galleries in North, South America and Europe. Pratik Rao, born and raised in Mumbai, was brought up within a South Indian family where music was worshipped with pure devotion. His music training began at the early age of 4 years where he studied at various academies including the Sangeet Mahabharti Academy and the Acharya Jialal Vasant Sangeet Niketan. Pratik completed the Sangeet Visharad Bachelor of Arts in Hindustani Classical Vocal Music from Prachin Kala Kendra in Chandigarh, India where he trained in Dhrupad Sangeet, under the tutelage of Pandit Sukhdev Chaturvedi for 12 years. Pratik also studied various vocal styles including ghazals, bhajans, dohes-poetry and regional vocal styles with master vocalists in their field including: Mr. Kuldip Singh, Mrs. Vidya Bellary, Mrs. Malladi Jayashree, Mr. Gautam Mukherji, Mrs. Samapada Bandodkar and Mr. Swapanil Bandokar. Career highlights include: winning the children’s contest Sa re ga ma pa on ZEE TV India in 2001, performing at “I Believe” conducted by the legendary music composer A.R. Rahman in 2004, promoting awareness of autism through composing and performing “Anthem for Autism” a government of India initiative in 2013, performing a YouTube cover Sajde for the film Kill Dil by Yash Raj Films with Jonita Gandhi in 2014 and performing a Tribute to A.R. Rahman at the Sony Centre in Toronto in February 2017. A Montréal-born Trinidadian-Canadian, Zaynab Wilson comes to the music scene with a wealth of cultural and musical diversity. Her recent Live EP (2018), is the debut to her career as a singer-songwriter where she draws musical and rhythmic inspiration from her Caribbean roots and merges folk with her heart and soul. Her voice is sweet, unaffected and naturally blended, and carries a strong rhythmic grounding. Zaynab grew up in a large family of musicians, specializing on Steelpan, and got an early start to the life of an artist. Being the youngest of the lot of six children, the formula was already set by the time she was six. Zaynab was performing throughout Eastern Canada with her family, the Von-Trapps of Steelpan, and gaining invaluable life lessons. Now, in addition to steelpan, Zaynab has grown into a sensitive, dynamic and well-rounded musician and is an equally talented percussionist, vocalist, songwriter and drummer, holding a drum-major degree from Humber College.